Whether your problem is staining, mould, or just general dirtiness, Slique’s stone cleaning processes can remove the contamination and make your stone look like new again. Stone surfaces are absorbent, and as such they can stain. Even the dense hard materials like granite are absorbent, and when liquids are left to sit on the surface they will penetrate into the surface and cause staining. On the other end of the spectrum highly absorbent stones like limestone and sandstone can very quickly stain, and these stains can penetrate very deeply making them much harder to remove. Mould and algae growth is also a common problem on stone – and the more absorbent a surface, the more prone it is to mould and algae growth. Stone surfaces are also susceptible to grout haze, surface dirt and grime, and rust. Whatever the issue is Slique has a process to resolve your problem. For a free consultation and quote call us on 0800 754 783 or fill in the form at the bottom of this page. 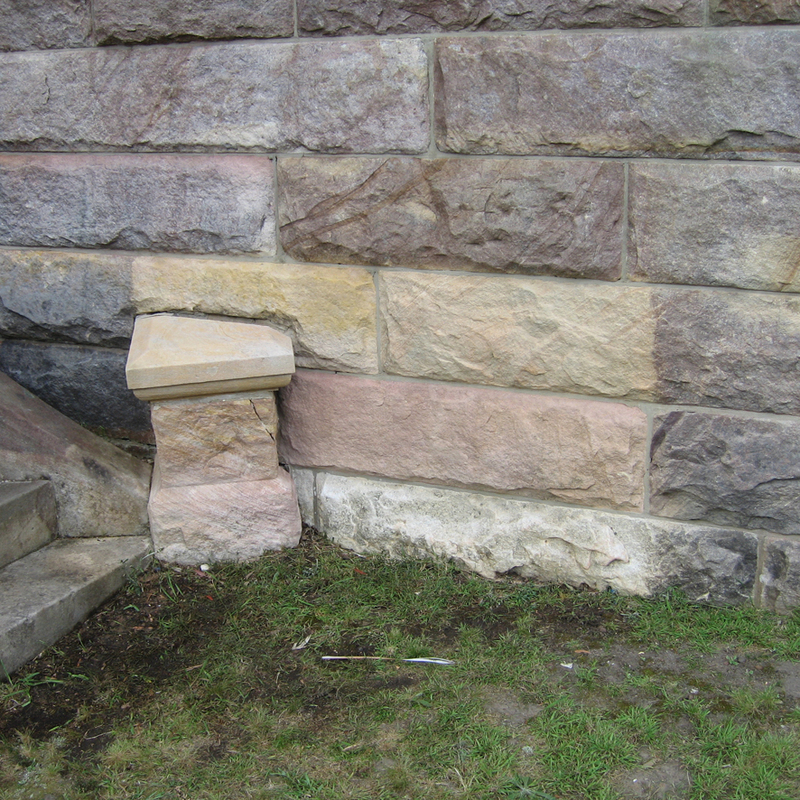 The central part of this sandstone wall has had professional stone cleaning by Slique, to remove algae as well as accumulated dirt and grime. Deep cleaning involves the application of cleaning agents (generally alkaline in nature) to remove surface dirt and grime and chemical residues. This process will also draw out staining as the chemical is pushed into the stone through agitation, and is then drawn out with a powerful wet vacuum. This process can also be used with chemicals to remove mould and algae, rust, grout haze or construction residues, as the chemicals are varied depending on the problem and stone. Poultices are used to remove very deep staining that is not removed with a deep cleaning process, which sometimes happens when stone has not been sealed or the spill has been left to sit for an extended period of time. The poultice is applied to the stone and covered with plastic. The poultice is essentially a drawing agent and because it cannot draw air and moisture from the atmosphere (as it is covered) it is very effective at drawing out deep stains. Honing processes are abrasives which remove a small amount off the top of the stone. This is very effective in removing surface grime and contamination on softer stones like limestone, and gives an even matt finish. To restore stone this is one of our most powerful processes and it gives a very clean even finish. If the stone was polished we could then use a gleam restoration process to restore the shine if desired. Grinding is a level above honing and physically removes more stone. This process is used in areas of deep damage, especially for scratching or very bad etching. For areas where the best possible result is required a grind over the stone does give the best result.